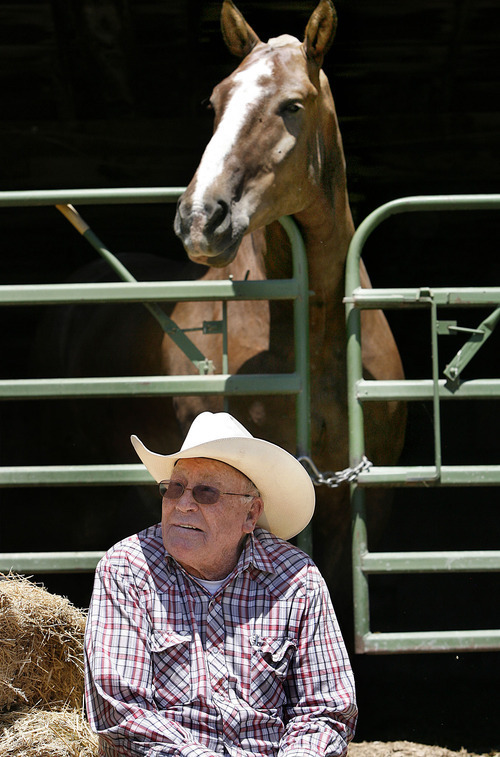 92-year-old South Jordan man's draft horses are national pulling champs. Scott Sommerdorf | The Salt Lake Tribune Jack McKee is shown at the reins at the West Jordan Horse Pull on July 4, 1951. 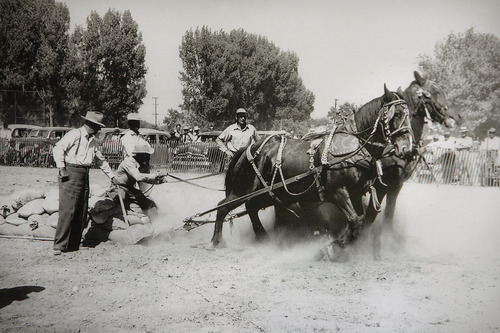 McKee, now 92, is famous for his pulling horses. He and his team of Belgian draft horses, Tom and Jasper, will be featured during the Days of '47 festivities. 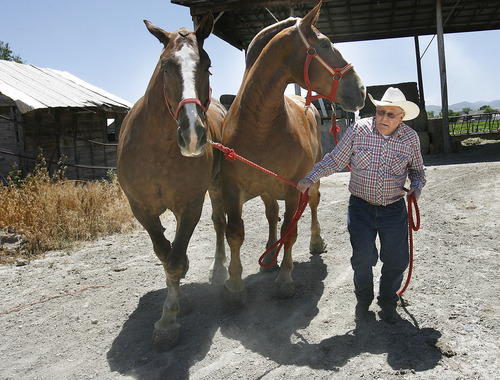 Scott Sommerdorf | The Salt Lake Tribune Jack McKee, 92, puts away his Belgian draft horses, Tom and Jasper. McKee is famous for his pulling horses. He and his team of Belgian draft horses will be featured during the Days of '47 festivities. 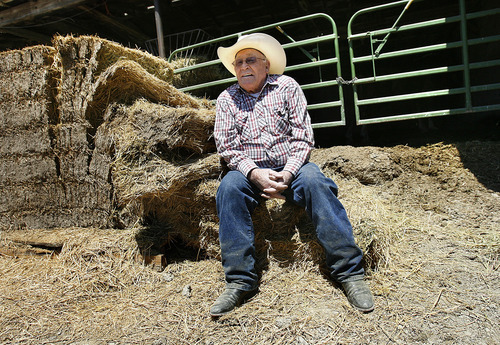 Scott Sommerdorf | The Salt Lake Tribune Jack McKee, 92, sits on a bale of hay to catch his breath after putting away his Belgian draft horses, Tom and Jasper. McKee is famous for his pulling horses. He and his team of horses will be featured during the Days of '47 festivities. 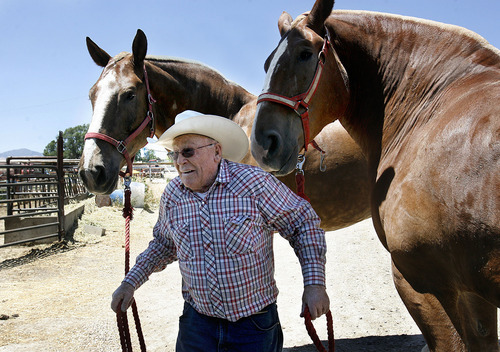 Scott Sommerdorf | The Salt Lake Tribune Jack McKee, 92, puts away his Belgian draft horses, Tom and Jasper, Thursday, July 14. McKee is famous for his pulling horses. He and his team of Belgian draft horses will be featured during the Days of '47 festivities. Scott Sommerdorf | The Salt Lake Tribune One of Jack McKee's Belgian draft horse towers over him as McKee, 92, sits on a bale of hay after putting away his pulling team of Tom and Jasper, Thursday, July 14, 2011. McKee is famous for his pulling horses. He and his team of Belgian draft horses will be featured during the Days of '47 festivities. Tom and Jasper are strong. In January, the team of Belgian draft horses won the heavyweight division of the horse pull at the National Western Stock Show in Denver. They pulled 16,620 pounds 20 feet on a sled through dirt. And they are big, too. Tom weighs about 2,460 pounds. Jasper tips the scales at 2,480. They stand 19 hands high at the shoulder. That's slightly bigger than their owner, Jack McKee, of South Jordan. He's 92 years old and has been competing in horse-pulling contests since the end of World War II. Jack, Tom and Jasper are set to appear in the Days of '47 Parade on Monday. They will be entry 27B. "When I was a kid, we always farmed with horses," McKee said. "One day my dad said, let's take Duke and Shorty over to Draper on the 24th [of July for the horse-pulling competition]. I've been pullin' horses ever since." The secret to a good pulling horse is "they have to like it," McKee said. "And then they have to have the talent." Several years ago, McKee went to Indiana to buy Tom and Jasper from Amish farmers who breed Belgian draft horses for heavy farm work. The horses get a workout six days a week at McKee's South Jordan farm. And they are pure muscle. As it turns out, the two are quite gentle and well-mannered. But a mere friendly nuzzle can push McKee along like he weighs nothing. It doesn't seem to bother McKee. He knows how to talk to horses, and Tom and Jasper know who is boss. As World War II ended, McKee, who served in the U.S. Merchant Marine, bought 80 acres in South Jordan, where he still lives. "In 1951, I bought a tractor," he recalled. "But I still kept a team, and I just kept pullin' all over." One of Jack's eight daughters, Della Backus, said horse pulling has been a family affair. "Since I was a little kid, we'd go to horse pullin' matches with him," she said. "It was a family thing. It was real nice." McKee's wife of 56 years, Reta, died in December 2005. McKee also has two sons, 30 grandchildren, 47 great-grandchildren and six great-great-grandchildren. McKee and his sons and grandsons and nephews pull in competitions nationwide in all three divisions: heavyweight, middleweight and lightweight. His family was originally from Vernal, where he was born and lived until age 13. "I was born in a sawed log house with no plumbing or electricity," he said with a smile. But McKee's father, a sheep man, went broke during the Great Depression and moved his family to the Salt Lake Valley in 1932. "My father rode a horse from Vernal to South Jordan at the age of 13," Backus said. "It took 6½ days." McKee says he doesn't know the secret to his longevity but that he always has worked two jobs. He ran his farm and also operated a general contracting business. "I poured 100 yards of concrete on my 80th birthday," he said. "I eat a good breakfast, some eggs and bacon and potatoes. I never do eat lunch. And just a snack at night, but not too late." His daughter said he's still sharp as a tack and just keeps going. "He amazes me. We had a 90th birthday party for him and hundreds of people came," she said. "And he remembered everybody and all the things they have done together over the years." 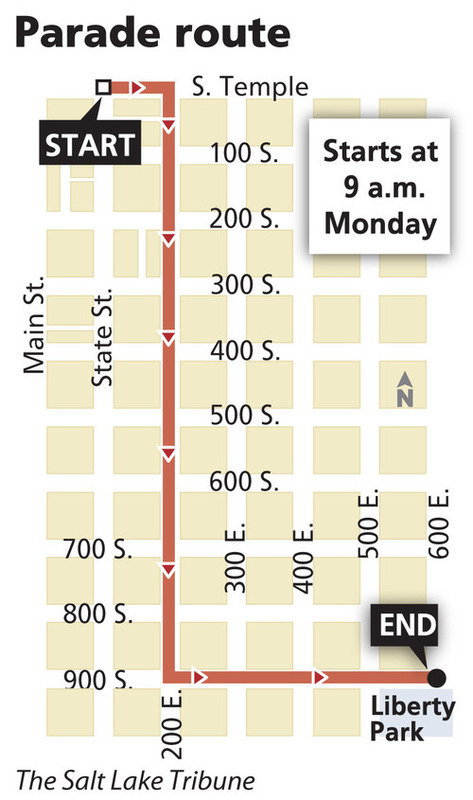 Salt Lake City • 5:30 a.m. Deseret News Marathon/10K/5K; 7 a.m. sunrise service, Tabernacle on Temple Square; 7 a.m.-dusk, Native American Celebration in the Park, Liberty Park, (fireworks at dusk); 9 a.m. Days of '47 Parade (South Temple and State Street, east to 200 East, south to 900 South, east to Liberty Park); 9 a.m.-5 p.m. Pioneer Heritage Festival, This Is the Place Heritage Park; 7 p.m. Days of '47 Rodeo, Maverik Center. Ogden • 7 a.m. Kiwanis Club pancake breakfast, Ogden Municipal Gardens; 9 a.m. Pioneer Days Parade 35th to 20th streets, Washington Boulevard; 6:30 p.m. pre-rodeo entertainment, Ogden Pioneer Stadium; 7:30 p.m. PRCA rodeo, Ogden Pioneer Stadium; 8:30 p.m. Miss Rodeo Utah coronation, Ogden Pioneer Stadium; fireworks after the rodeo.